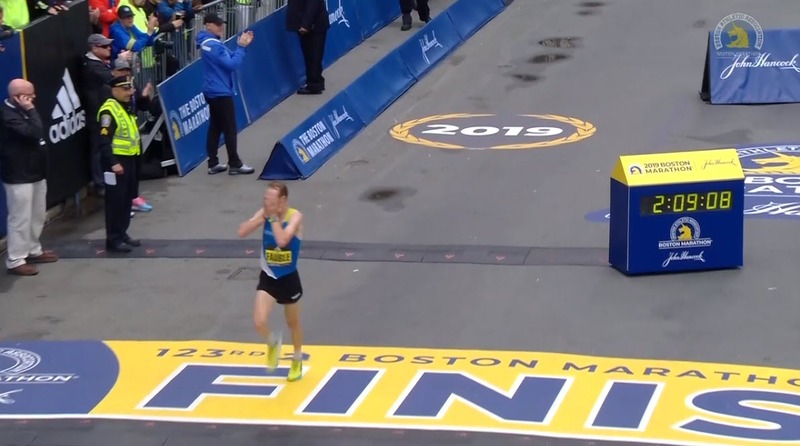 BOSTON — Monday was a good day for two American men in the 123rd Boston Marathon as both Scott Fauble and Jared Ward ran big PRs to join the sub-2:10 club and earn the 2020 Olympic standard by virtue of their top-10 finishes. Fauble clocked 2:09:09 (previous pb: 2:12:28) to finish 7th, one spot ahead of Ward, who ran 2:09:25 for 8th (previous pb: 2:11:30). Surprisingly, those times were not good enough to crack the top five — this was just the third time in the last 11 years than an American had failed to finish in the top five. While Fauble and Ward were all smiles after the race, some of the American elites will leave Boston feeling quite different. Shadrack Biwott, 4th and 3rd the last year, could only manage 15th in 2:13:11. 36-year-old Dathan Ritzenhein did succeed in finishing his first marathon in four years, but the result was the slowest time of his career: 2:16:19 for 19th place. The US Army’s Augustus Maiyo did manage a PR of 2:12:40, but he missed out on the all-important Olympic standard, placing 13th (it took sub-2:10 to finish in the top 10 today — a very deep year in Boston). So too did Elkanah Kibet (11th in 2:11:51), who came one spot, but almost two minutes shy of the top 10. We break down what it all means below, including interviews with Fauble and Ward and their coaches, Ben Rosario and Ed Eyestone. Two American men broke 2:10:00 today and that’s big news. While 160 men went sub-2:10 in the marathon in 2018, accomplishing the feat a total of 209 times, only one of those men was an American, Galen Rupp. 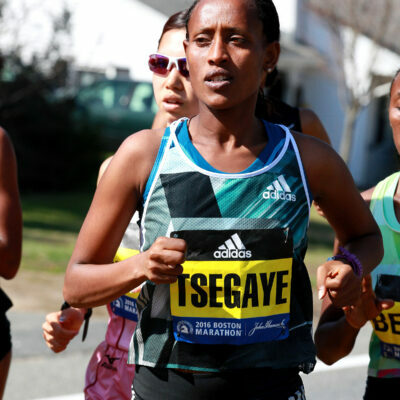 Aside from Rupp, it had been five years since an American had broken 2:10 in a marathon, not since Meb Keflezighi won Boston on April 21, 2014. 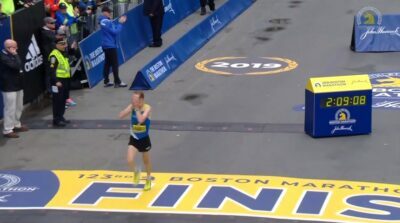 Other than Rupp, an American-born athlete hadn’t broken 2:10:00 in the marathon since Dathan Ritzenhein did it on October 13, 2013, in Chicago. That was 2,010 days ago. But both Fauble and Ward did it today and they did it in style. Ward had the lead as the leaders ran into the Wellesley Scream Tunnel, and Fauble had the lead as the leaders hit the Newton Hills at mile 16. Both guys took the lead as they said they were trying to run even and not surge, so when the Africans slowed down they just kept up their steady pace. Afterward, both Ward and Fauble said they were energized by the huge crowd support. Fauble added that he now thinks he knows what an NBA player feels like when they play before a huge crowd. Ward, who in addition to being a marathoner is a statistics professor at BYU, said he knew from the beginning he had a shot at sub-2:10. Ward’s coach Ed Eyestone was watching the race from his hotel room, and he knew that when Ward took the lead, it was not in order to make a big, dramatic move. He trusted that if Ward was in front, he would still make smart decisions that would allow him to finish strong once the race got hard after 20 miles. “My wife was pregnant with our third during the Olympics in Rio so she was home with the kids and pregnant and so I’d love to have that experience again and bring her and the kids along,” said Ward. Ben Rosario is the coach of Fauble and the HOKA NAZ Elite team. He was very pleased with Scott’s run today. Rosario said it was “a big-time A+” run for Scott, noting that, “With a mile to go he was thinking to himself, ‘I might be able to break 2:09’. 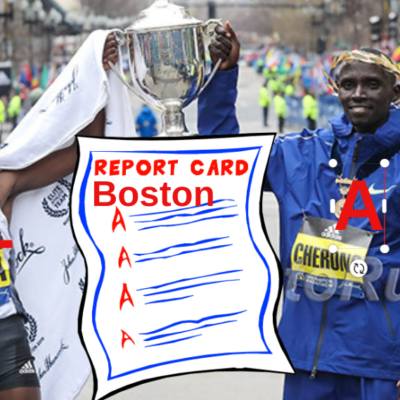 Just think about that.” Rosario knew Fauble was fit coming in, but delivering on the tough Boston course is never a sure thing. 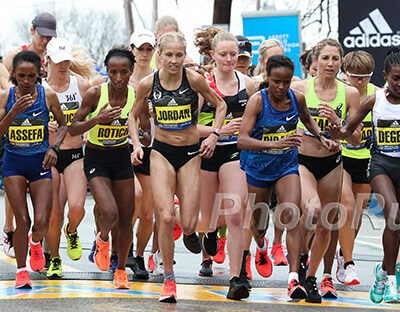 Everything they are doing from this point forward is with the 2020 Olympic Marathon Trials in February in mind. Ben wants Scott to run a lot of shorter races between now and the Trials just to experience different situations that might come up at the Trials. “I’d like him to race a lot because [at] the Trials there are so many different scenarios,” Ben said. The initial plan was for Scott to not run another marathon before the Trials, but Ben said that plan may change. Nonetheless, Scott has the luxury of not having to chase an Olympic qualifying standard (sub-2:11:30) prior to the Trials as his top 10 today is an automatic Olympic qualifier. As for the Trials, Rosario fully expects them to be slow. He said, “On that course with so many ups, maybe 2:13 wins it.” This was coming from the coach of a guy who just ran 2:09. Rosario noted that Boston is a net downhill, but he thought all things considered today’s performance for Scott is similar to what he could have run on a flat course like Chicago. Jared Ward has four children under the age of 8 at home (7, 4, 2 and 4-month-old Magnolia) and his wife, Erica, was in Boston with Magnolia today. It’s a team effort in balancing training and family with Erica taking the night shift with the kids and Jared helping out during the day. That meant more treadmill running for Jared in his buildup, but it paid off. Jared overall was pleased with the effort. He said he races Boston off of feel and the first thing he noticed was it was fairly hot (62 at finish) for running and he felt others agreed with that assessment as they were grabbing water and dumping it on their heads. Once the field got away from him on Heartbreak Hill, he was focused on getting in the top 10 and going sub-2:10. Ward said Eyestone likes to do what worked well in the past, and that would mean not doing a fall marathon prior to the Olympic Trials. Ward, with his top 10 today, already has his Olympic qualifier, but despite all of the reasons why he doesn’t need to run a fall marathon, he is thinking he wants to do one. “I feel very much I’m on a marathoning high right now and there are a lot of fall marathons that I’m excited about entertaining running… The marathon is clicking right now and I’m excited about it,” he said. Ward said Erica knows the marathon really doesn’t start until the 18-mile mark. So we asked her what she thought when Ward went to the front around Wellesley and raised his hand to his ear to pump up the crowd. “I was thinking, ‘What are you doing? '” she said. Just having a little fun on a very good day for the Ward family. The US Army’s Elkanah Kibet (11th in 2:11:51) and Augustus Maiyo (13th in 2:12:40) came up short of the automatic Olympic qualifying standard of a top-10 finish. The run by Maiyo was a PR (previous best of 2:13:16 in Boston in 2017; he ran 2:16:18 in Rotterdam last fall), but since he didn’t get the Olympic qualifier it was hard to be too excited. When asked what’s next he said, “Still chasing 2:11. 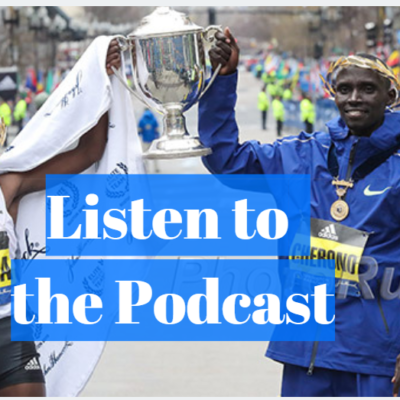 That’s what we have to hit to make the Olympics.” Maiyo and runners like Shadrack Biwott (15th in 2:13:11) and Dathan Ritzenhein (19th in 2:16:19) now face some hard decisions about whether to do a fall marathon or risk going into the Olympic Trials without the standard. A lot of US runners are in the same boat, and unless the IAAF changes its rules or USATF decides to go off of world rankings to help select its Olympic Marathon team (the exact selection procedure remains up in the air), the Olympic Marathon Trials on the men’s side might be a race between a handful of guys who already have the standard. Everyone else could just be running for show, knowing they are not going to hit the 2:11:30 automatic time standard on the difficult Trials course. We’ll have a lot more on the Trials implications later on LetsRun.com. The fastest American in the field by PR was 36-year-old Dathan Ritzenhein, who ran 2:07 in Chicago in 2012. 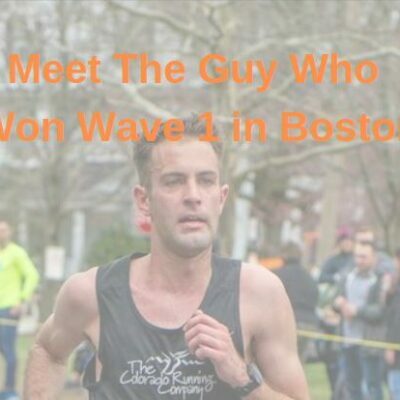 But Ritz hadn’t finished a marathon in four years heading into Boston 2019, and though he ended that drought, 19th place in 2:16:19 was definitely not what he was looking for. Ritz was only 13 seconds off the lead at halfway, hitting 13.1 miles in 1:04:41. At 21 miles, he was still on sub-2:12 pace but he ended up running his second half in an ugly 1:11:38. The good news is that Ritzenhein made it through his buildup and 26.2 miles of racing in one piece. 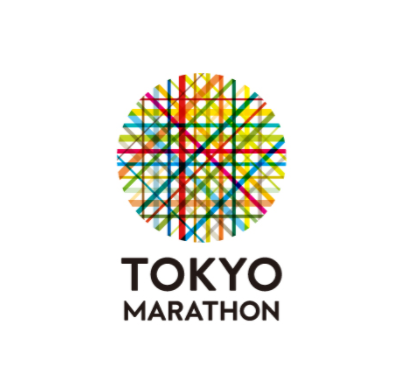 But perhaps more strength is in order for his next buildup after doing just eight weeks of marathon-specific training ahead of Boston 2019. After all, Ritz’s 2019 Boston buildup was an experiment. Now he’s got the data and it’s up to him and coach Kevin Hanson to draw some conclusions.